Culture of normal cells in their three-dimensional context represents an alternative method to study early events required for cellular transformation and tumorigenesis. This method is used to grow normal ovarian and oviductal cells to study early events in ovarian cancer formation. King, S. M., Quartuccio, S., Hilliard, T. S., Inoue, K., Burdette, J. E. Alginate Hydrogels for Three-Dimensional Organ Culture of Ovaries and Oviducts. J. Vis. Exp. (52), e2804, doi:10.3791/2804 (2011). Ovarian cancer is the fifth leading cause of cancer deaths in women and has a 63% mortality rate in the United States1. The cell type of origin for ovarian cancers is still in question and might be either the ovarian surface epithelium (OSE) or the distal epithelium of the fallopian tube fimbriae2,3. Culturing the normal cells as a primary culture in vitro will enable scientists to model specific changes that might lead to ovarian cancer in the distinct epithelium, thereby definitively determining the cell type of origin. This will allow development of more accurate biomarkers, animal models with tissue-specific gene changes, and better prevention strategies targeted to this disease. Maintaining normal cells in alginate hydrogels promotes short term in vitro culture of cells in their three-dimensional context and permits introduction of plasmid DNA, siRNA, and small molecules. By culturing organs in pieces that are derived from strategic cuts using a scalpel, several cultures from a single organ can be generated, increasing the number of experiments from a single animal. These cuts model aspects of ovulation leading to proliferation of the OSE, which is associated with ovarian cancer formation. Cell types such as the OSE that do not grow well on plastic surfaces can be cultured using this method and facilitate investigation into normal cellular processes or the earliest events in cancer formation4. Alginate hydrogels can be used to support the growth of many types of tissues5. Alginate is a linear polysaccharide composed of repeating units of β-D-mannuronic acid and α-L-guluronic acid that can be crosslinked with calcium ions, resulting in a gentle gelling action that does not damage tissues6,7. Like other three-dimensional cell culture matrices such as Matrigel, alginate provides mechanical support for tissues; however, proteins are not reactive with the alginate matrix, and therefore alginate functions as a synthetic extracellular matrix that does not initiate cell signaling5. The alginate hydrogel floats in standard cell culture medium and supports the architecture of the tissue growth in vitro. A method is presented for the preparation, separation, and embedding of ovarian and oviductal organ pieces into alginate hydrogels, which can be maintained in culture for up to two weeks. The enzymatic release of cells for analysis of proteins and RNA samples from the organ culture is also described. Finally, the growth of primary cell types is possible without genetic immortalization from mice and permits investigators to use knockout and transgenic mice. Prepare a 0.5% (w/v) solution of sodium alginate, prepare from a modified version of the protocol described previously5, using sterile PBS and heat to 37°C. Mix by inversion or rocking, but do not vortex. Draw the alginate into a 1 ml syringe with a 25 G needle and maintain at 37°C. Prepare 10mM sterile CaCl2 solution for crosslinking the alginate upon tissue encapsulation and warm to 37°C. Prepare 1mL of culture medium (αMEM + 5 units penicillin and 5 μg/ml streptomycin) per well in a 24 well plate for each experiment. Include various drugs, peptides, or viruses in the culture medium. For transfection prior to organ encapsulation, incubate tissue with Lipofectamine 2000 and plasmid DNA for four hours at 37 °C. Dissect the organs from the animal, remove any fat or residual tissue, gently pull off the bursa membrane surrounding the ovary, and cut the ovary or oviduct into four pieces by bisecting the organ. Animals were euthanized by CO2 asphyxiation followed by cervical dislocation. For the oviduct, gently uncoil the tissue by pulling apart the connecting membranes and extending the ends of the tube in opposite directions using forceps before cutting. Place a single alginate droplet (~1-3 μL) onto a sterilized mesh fiber. Using sterile forceps, move a piece of organ into the alginate droplet and center the droplet using forceps or a sterile needle. Invert the droplet containing the organ piece (organoid) by grasping the mesh fiber with sterile forceps and turning it upside down to allow gravity to force the alginate into a hanging drop. Tap the forceps on the edge of a 10cm petri dish containing 10mM CaCl2 solution so that the drop falls into solution. Incubate for 2 minutes, remove with sterile spoon containing pores to release extra 10mM CaCl2, and transfer into the culture medium. Up to four alginate gels can be transferred into a single well of a 24 well plate containing the culture medium. Culture for a defined time period. For the solubilization of the alginate gel, incubate the cultures in alginate lyase (3.4 mg/ml) dissolved in Leibovitz's L-15 media at 37°C for 30 minutes or until gel is completely dissolved. Remove the tissue from the alginate lyase. For collection of the OSE, incubate the organoid with 500 units of collagenase in Leibovitz's L-15 media for 1 hour8. Vortex in 2 second pulses (2 seconds vortex and 2 seconds rest) on medium power for 1 minute, followed by 1 second pulses (1 second vortex and 1 second rest) for 1 minute. Let organ pieces fall to bottom of microcentrifuge tube and pipette supernatant into fresh sterile microcentrifuge tube. Centrifuge 3 minutes at 3000 rpm to pellet ovarian surface epithelium. For collection of the tubal epithelium, cut the tube lengthwise and place on tissue culture plastic in DMEM with 5 units penicillin and 5 μg/ml streptomycin and 4% (v/v) FBS. Over 3-5 days, cells will "crawl" out of the tubal stroma and grow on tissue culture plastic9. Collect the alginate encapsulated bead from the culture medium at selected time point. Recrosslink the alginate to stiffen the gel by dropping the culture into sterile 10mM CaCl2 solution for two minutes. Fix the alginate encapsulated organ in 2% paraformaldehyde containing 50 mM sucrose, 10 mM CaCl2 and 50 mM sodium cacodylate to ensure that the gel stays solid and fully encapsulates tissue during fixation. Following tissue processing, embed the entire alginate-encapsulated organ culture piece into paraffin and section with a microtome to generate 5 μm sections. The alginate will be dissolved and removed from the slide if performing immunohistochemistry due to heat based antigen retrieval. The alginate will remain and stain for eosin under standing hematoxylin and eosin staining. An example of a three-dimensional organ culture of the ovary and oviduct is shown in Figure 1. Ovaries can be cut into different size pieces, and OSE proliferate and migrate to repair the surface that was wounded from the incision with the scalpel. During this process, the correct orientation of the OSE relative to the underlying stroma is maintained, with the OSE encapsulating the ovary. As shown in Figure 2, the OSE of ovaries cut in half encapsulate the ovary more completely as compared to ovaries cut into quarters or eighths. The wound repair of the ovarian surface can be studied in the context of the entire ovary and may shed light on how ovulation and surface repair induces ovarian surface transformation. The endpoint of the experiment depends on the information that is required. Tissue architecture, cellular morphology, and specific cellular growth rates are easily monitored using paraffin sections. For example, a single layer of ovarian surface epithelium is observed after culturing in serum-free αMEM for 7 days (Figure 3A) while addition of 5 μg/ml insulin for 7 days induces hyperproliferation of the ovarian surface epithelium and formation of multiple layers of cells (Figure 3B). By adding bromodeoxyuridine to the cultures at a final concentration of 10 μM 24 hr prior to fixation, proliferation of cells can be measured (inset 3A and 3B). For cultures maintained in serum-free αMEM, approximately 3-5% of OSE undergo proliferation during the 24 hr labeling period (inset 3A), while a larger percentage of granulosa cells proliferate. Addition of insulin to the culture media increases the percentage of proliferating OSE to approximately 30% of total OSE (inset 3B). Immunofluorescence of green fluorescent protein (GFP) can be visualized through the alginate gel with standard microscopy following cDNA transfection (Figure 3C). While alginate organ culture provides for growth and analysis of ovarian surface epithelium and primary follicles, it should be noted that the mature, secondary follicles fail to survive in this culture system (Figure 3D). Culture of individual follicles to maturity within an alginate hydrogel matrix has been described elsewhere10. Alterations in protein or RNA can be analyzed from the entire organ or from specific cell types using enzymatic degradation (Figure 4). 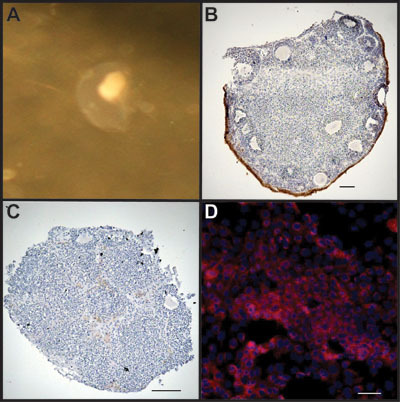 Treatment of cultured ovarian organoids with collagenase leaves the underlying stroma intact (Figure 4C) while allowing for enrichment of OSE in the cell pellet obtained following treatment, although some stromal cells are also isolated (Figure 4D). Figure 1. Mouse ovary three-dimensional culture system used to propagate OSE after wounding. A) Under the microscope, the bursa and the surrounding fat pad were removed. B) Intact ovary (O) with oviductal tube (T) and fat pad (F). C) Ovary with bursa and fat pad removed (left) and uncoiled oviduct (right). D) Ovarian or oviductal organoids were placed into an alginate droplet. E) Alginate encased organoids were dropped into a CaCl2 solution crosslinking the alginate to form a gel. F) Alginate encapsulated ovarian organoid. G) Alginate encapsulated oviductal organoid. H) Alginate encapsulated organoids incubated in culture medium. Figure 2. Surface area regenerated by ovarian surface measured by cytokeratin 8. Encapsulation of ovarian organoids by the OSE after being cut into eighths, quarters, and halves, cultured in BSA medium, and measured by immunohistochemical analysis using cytokeratin 8 (CK8) antibody. Figure 3. Alginate culture system allows passage of growth factors and transfection of cDNA into the OSE, but does not support rapid growth and maturation of follicles. A) Ovarian organoid cultured for 7 days in basal medium analyzed for CK8 expression, which marks the OSE. Inset, serial section stained for BrdU incorporation. B) Addition of insulin to the culture media induces hyperplasia of the OSE. Inset, serial section stained for BrdU incorporation. C) Ovarian organoid transfected with cDNA to express GFP. D) Alginate culture system supports growth of primordial follicles (red arrowhead), but not mature secondary follicles (black arrow). Figure 4. OSE can be isolated for analysis following culture. A) Organoid cultured in medium for up to 2 weeks. B) Encapsulated organoid is treated with alginate lyase to leave organoid intact. Ovary is stained with CK8 to mark OSE. C) Organoid is treated with collagenase to separate OSE from underlying stroma. Remaining tissue piece was stained with CK8 to highlight removal of the ovarian surface. D) Collected cells following treatment are enriched for OSE as stained for CK8 (red). Cells are counterstained with DAPI to mark nuclei. The development of a three-dimensional organ culture system utilizing alginate hydrogels represents a versatile method for analyzing many different tissue types from a wide variety of organisms. The use of 3D cultures can be extended to the fields of tissue engineering and regenerative medicine as it provides a scaffold on which cells can grow11. Currently, our laboratory is undergoing initial studies using human ovarian and fallopian tube tissue; however, culture of human and non-human primate follicles has been described12,13. The use of alginate hydrogels to culture organoids offers several advantages over other types of hydrogels, such as those incorporating collagen, fibrin, or hyaluronic acid. Alginate gels at room temperature and neutral pH, providing for little disruption to the tissue as the gel encapsulates the organoid14. Alginate does not react with cellular proteins, providing a chemically inert support for tissue growth5. The gel can be enzymatically degraded using alginate lyase, which does not degrade the encapsulated tissue, allowing for retrieval of cultured cells15. One disadvantage of the use of alginate hydrogels for three-dimensional tissue culture is that the ionic crosslinking providing mechanical support for the hydrogel loses stability over time, necessitating limited culture periods and re-crosslinking of the alginate prior to fixation5. Critical aspects of this protocol are maintaining sterility throughout the culture process, as well as careful dissection of the ovarian and oviductal tissue to prevent disruptions to the tissue morphology. The ovary and oviduct are particularly suited to this method because ovarian surface epithelium cultured on traditional cell culture plastic rapidly undergoes epithelial to mesenchymal transition, morphological changes, and cell death unless immortalized, for example by expression of SV40 T/t antigen or hTERT16,17. Poor growth of normal OSE on plastic hinders analysis of potentially pre-malignant changes. The organ culture system also supports the growth of the ovarian surface epithelium or oviductal epithelium in contact with the underlying stromal cells, which may play a role in the normal and malignant physiology of the cells18. Culture of these tissue types in alginate hydrogels provides mechanical support to maintain the three dimensional architecture of the tissue, while the gel itself does not interact with the cells5. Using this method for culturing ovarian surface epithelium or oviductal epithelium allows for analysis of molecular and morphological changes resulting from isolated manipulations of the culture. The alginate hydrogel system permits free passage of transfected cDNA, siRNA, and shRNA, as well as hormones, and growth factors19. While transient transfection is not specific for the OSE, because this cell type is on the outer surface of the organoid higher transfection efficiency is achieved in the OSE compared to other cell types in the interior of the ovary, such as granulosa cells. Incorporation of bromodeoxyuridine during the culture period labels dividing cells by monitoring changes in cellular growth in response to experimental conditions. Molecular changes at the RNA or protein level can then be determined to elucidate mechanisms leading to neoplastic changes. While the precise etiology of ovarian cancer is unknown, an increased number of lifetime ovulations have been shown to correlate with an increased risk for ovarian cancer20. In vivo analysis of hypotheses linking ovulation to ovarian cancer presents many challenges in determining the contributions of the gonadotropins, proliferation, and inflammation to carcinogenesis21-23. Alginate hydrogel culture of ovaries and oviducts allows for isolated, direct comparison of each of these components in the ovarian surface epithelium and oviductal epithelium, leading to new information about the origin of ovarian cancer and its progression from normal cells to tumors. This work was supported by the Ovarian Cancer Research Fund [grant LT/UIC/01.2011], the UIC Center for Clinical and Translational Science, the UIC Cancer Center, and the National Institutes of Health grant C06RR15482. Experiments on animals were performed in accordance with the guidelines and regulations set forth by AAALAC under approved animal care protocols by the Animal Care and Use Committee at UIC. Animals for this project are housed in barrier rooms in the Biological Resources Laboratory (BRL) at the University of Illinois at Chicago. The BRL has a fully veterinary staff that monitors animals at least twice daily and provides advice on animal care. Jemal, A. Cancer statistics, 2009. CA Cancer J Clin. 59, 225-249 (2009). Auersperg, N., Woo, M. M., Gilks, C. B. The origin of ovarian carcinomas: a developmental view. Gynecol Oncol. 110, 452-454 (2008). Crum, C. P. The distal fallopian tube: a new model for pelvic serous carcinogenesis. Curr Opin Obstet Gynecol. 19, 3-9 (2007). Jackson, K. S., Inoue, K., Davis, D. A., Hilliard, T. S., Burdette, J. E. Three-dimensional ovarian organ culture as a tool to study normal ovarian surface epithelial wound repair. Endocrinology. 150, 3921-3926 (2009). Rowley, J. A., Madlambayan, G., Mooney, D. J. Alginate hydrogels as synthetic extracellular matrix materials. Biomaterials. 20, 45-53 (1999). Augst, A. D., Kong, H. J., Mooney, D. J. Alginate hydrogels as biomaterials. Macromol Biosci. 6, 623-633 (2006). Amsden, B., Turner, N. Diffusion characteristics of calcium alginate gels. Biotechnol Bioeng. 65, 605-610 (1999). Symonds, D. A., Miller, K. P., Tomic, D., Flaws, J. A. Effect of methoxychlor and estradiol on cytochrome p450 enzymes in the mouse ovarian surface epithelium. Toxicol Sci. 89, 510-514 (2006). Umezu, T., Hanazono, M., Aizawa, S., Tomooka, Y. Characterization of newly established clonal oviductal cell lines and differential hormonal regulation of gene expression. In Vitro Cell Dev Biol Anim. 39, 146-156 (2003). Xu, M., Kreeger, P. K., Shea, L. D., Woodruff, T. K. Tissue-engineered follicles produce live, fertile offspring. Tissue Eng. 12, 2739-2746 (2006). Wilson, R. F., Wiencek, R. G., Balog, M. Predicting and preventing infection after abdominal vascular injuries. J Trauma. 29, 1371-1375 (1989). 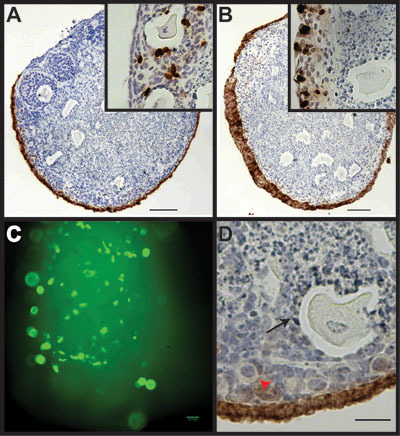 Xu, M. In Vitro Oocyte Maturation and Preantral Follicle Culture from the Luteal Phase Baboon Ovary Produce Mature Oocytes. Biol Reprod. Forthcoming Forthcoming. Xu, M. In vitro grown human ovarian follicles from cancer patients support oocyte growth. Hum Reprod. 24, 2531-2540 (2009). Jen, A. C., Wake, M. C., Mikos, A. G. Review: Hydrogels for cell immobilization. Biotechnol Bioeng. 50, 357-364 (1996). Iwamoto, Y. Purification and characterization of bifunctional alginate lyase from Alteromonas sp. strain no. 272 and its action on saturated oligomeric substrates. Biosci Biotechnol Biochem. 65, 133-142 (2001). Auersperg, N., Maines-Bandiera, S. L., Dyck, H. G., Kruk, P. A. Characterization of cultured human ovarian surface epithelial cells: phenotypic plasticity and premalignant changes. Lab Invest. 71, 510-518 (1994). Auersperg, N., Ota, T., Mitchell, G. W. Early events in ovarian epithelial carcinogenesis: progress and problems in experimental approaches. Int J Gynecol Cancer. 12, 691-703 (2002). Kruk, P. A., Uitto, V. J., Firth, J. D., Dedhar, S., Auersperg, N. Reciprocal interactions between human ovarian surface epithelial cells and adjacent extracellular matrix. Exp Cell Res. 215, 97-108 (1994). West, E. R., Xu, M., Woodruff, T. K., Shea, L. D. Physical properties of alginate hydrogels and their effects on in vitro follicle development. Biomaterials. 28, 4439-4448 (2007). Auersperg, N., Wong, A. S., Choi, K. C., Kang, S. K., Leung, P. C. Ovarian surface epithelium: biology, endocrinology, and pathology. Endocr Rev. 22, 255-288 (2001). Choi, J. H., Wong, A. S., Huang, H. F., Leung, P. C. Gonadotropins and ovarian cancer. Endocr Rev. 28, 440-461 (2007). Fathalla, M. F. Incessant ovulation--a factor in ovarian neoplasia. Lancet. 2, 163-163 (1971). Espey, L. L. Current status of the hypothesis that mammalian ovulation is comparable to an inflammatory reaction. Biol Reprod. 50, 233-238 (1994). I want this video, as to learn the organ culture of oviducts and ovaries, and I want to know whether tubal epithelial grow into ovary wound repair?